The Attack phase is the first step of the Dukan Diet. It is also known as the Pure Protein (PP) phase. The sudden change in your eating habits triggers a fast and encouraging weight loss, which works to motivate you for the rest of your diet. More than 40 lbs. to lose: after consulting with your physician, this phase can last up to 7 days. Ketosis: eat unlimited Pure Protein foods to avoid hunger and cravings. Only NATURAL Pure Protein foods are allowed on the Attack phase: 68 animal proteins, in unlimited quantity. Some studies have proven that proteins produce a satiating effect. * The protein intake in the Dukan Diet Attack phase increases the speed of weight loss while flushing out the excess water from your body. The digestion of protein produces ketones which are eliminated in your urine. This is why it is imperative that you drink 6 to 8 cups of water a day. Oat bran will provide some carbs and daily fiber that bind to calories from the food consumed and limit their absorption. 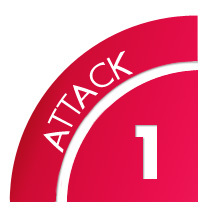 Start exercising gradually during the Attack phase. Take advantage of the fat burning effect of exercise – particularly in the morning. No matter your fitness level, walking is an activity that anyone can do. It is natural, costs nothing, and has many benefits. The Dukan Diet is a comprehensive diet program with 4 phases: 2 phases to for weight loss and 2 phases to keep your True Weight forever. The completion of these 4 phases is essential. The third and fourth phases of the Dukan Diet, Consolidation and Stabilisation, help you maintain your weight and keep it off for life. *Duraffourd, Celine, De Vadde, Filipe et al. (2012). Mu-Opioid Receptors and Dietary Protein Stimulate a Gut-Brain Neural Circuitry Limiting Food Intake, Cell Metabolism, 150 (2) 377-388. Retrieved from: http://www.sciencedirect.com/science/article/pii/S009286741200760X.